Note that "Speechless" is enforced. Xu Shu cannot choose to 'turn off' this power. "Speechless" prevents damage caused by Lightning to Xu Shu. "Speechless" prevents damage elemental damage caused by tool cards that are transmitted through Chains. For example, if a character who is chained to Xu Shu is damaged via Blaze, the damage caused to Xu Shu is prevented. If Xu Shu chooses to activate "Recommendation," he does so after his discard phase. Xu Shu can choose to discard equipped equipment cards to activate "Recommendation." The target of "Recommendation" cannot choose option one if they are at full health. The benefits of choosing option 2 of "Recommendation" include re-flipping a flipped character card and being released from Chains. Note that a character that is flipped face up and is not chained cannot choose this option if they are not chained or flipped face down. "Speechless" provides Xu Shu with a large amount of protection against tool cards. This protection covers Barbarians, Hail of Arrows, Duel, Blaze, and Lightning. "Recommendation" is useful for helping allies. It gives three useful options to the target. Option one is a good trade-off because Xu Shu only has to discard one card to allow an ally to regain one unit of health. Option two is particularly useful with characters whose abilities require them to flip their character card. Finally, option three is also a good trade-off because it allows an ally to draw two cards while Xu Shu only discards one card. This ability works well with "Speechless" because it applies to tool cards that he cannot use anyway to cause damage. As with the original Xu Shu, Xu Shu has no defense against Attacks. This is notable since it is one of the most common methods of causing damage. Xu Shu is terrible in one-on-one situations. Since neither character can use non time-delay tool cards to damage each other, Xu Shu enjoys no benefit. If the other character has more health or a power that does not involve non time-delay tool cards, Xu Shu will be at a huge disadvantage. SP Diao Chan/Cao Ren/SP Cao Ren/God Lu Bu/God Cao Cao - These characters have powerful abilities that force them to flip their character card. Xu Shu can use "Recommendation" to mitigate this weakness. 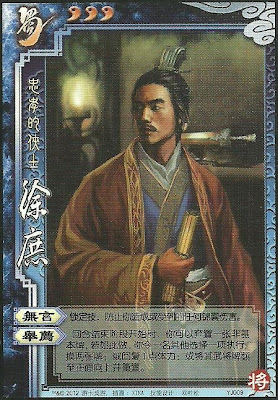 Yuan Shao/Xun You/Zhu Rong/Cao Cao - These characters have abilities and strategies that involve tool cards that target all other characters. Because Xu Shu cannot be damaged by these cards, they can play their strategies without fear of hurting him. This is very useful to them if Xu Shu is an ally. King Xu Shu is a mediocre king choice. "Recommendation" is more useful in helping allies than it is in keeping Xu Shu alive. However, it should be noted that "Speechless" is useful in that it provides Xu Shu defense against many tool cards. Loyalist Xu Shu is a competent loyalist. The king does not need to worry about damaging Xu Shu with tool cards and Xu Shu can provide the king with additional support via "Recommendation." Rebel Xu Shu is a competent rebel. "Recommendation" is a very helpful support power. Spy Xu Shu is a poor spy. "Speechless" is useful in providing him with a defense, but "Recommendation" is mainly useful in team situations. In a one-on-one scenario, Xu Shu will be quite weak. Xu Shu is definitely an improvement over his original counterpart. That being said, Xu Shu is not outstanding unless paired with a character who must flip their character card to activate an ability. "Recommendation" is much more useful now that is no longer simply a one-to-one ratio of discarded cards to drawn cards. 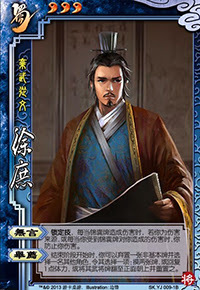 However, it should be noted that in order to 'store' a non-basic card in his hand at the end of his turn, Xu Shu may have to discard additional cards in his discard phase that he normally would have to if he did not want to use this power. This power is nice since it allows Xu Shu to heal damaged teammates, but it is important to keep in mind that other characters like Wu Guo Tai and Hua Tuo can do this more easily. "Speechless" provides a lot less 'cover' against tool cards than it originally did since Xu Shu can now be targeted by Steal, Coerce, and Break. Finally, our biggest gripe with Xu Shu is that there is no correction to the original's complete lack of options to employ in a one-on-one situation.